When I found out the conference for WV English Educators was going to focus on inclusive classrooms, I wanted in! I submitted my proposal on Human Rights Ed and was accepted to present. Yay! After that initial excitement, my thoughts became filled with anxiety– What makes my classroom worth sharing? Who made me an expert? What can I offer other teachers? Who made me an expert? Could this work in other classrooms? Who made me an expert? (Impostor syndrome was hitting me REALLLLLY hard. But that’s something for another post). Obligatory “This is what a presenter/teacher/activist looks like” picture. The truth is, I saw a need in my classroom and sought resources to help my students. That’s how this journey into HRE began. Flash forward five years, and here I am, sharing tips, tricks, pedagogy, strategies, and resources with a room full of curious teachers, educators, and even community leaders. And it was AMAZING. Their ideas, their willingness to try these in their classrooms, and their vulnerability made the session a success. But enough about me. At each session over the two days, I thought about how these new ideas, strategies, and resources could be incorporated into my own classroom. And that’s how the magic happens, right? When you see something at a conference, or online, or in a coworkers classroom, and you can’t wait to get back to your own students to try it out! Tricia Ebarvia got us thinking about identity, bias, and the canon. What a great way to kick off Day 2! #DisruptTexts – I’m pretty lucky, because in the middle school I teach at, I have autonomy over the books I chose and the units I plan. As long as I’m teaching the standards, I can get away with teaching YA Lit, classic lit, and even nontraditional media. But, am I doing enough to disrupt the canon? If I’m still choosing white authors, am I supporting my own biases? I’m excited to learn more from Tricia Ebarvia! 2. #TeachLivingPoets- Although I only caught half of the session, it really got me thinking about my past year of teaching Creative Writing to my 8th graders. I need to seek out contemporary authors, instead of relying on the poetry I used in college. If students can see living poets, people that experience the same world they do, maybe they will be more interested in writing poetry themselves! Reader Identity & Tracking Reading shared by Joel Garza. The graphic is based upon Rudine Sims Bishop’s work. Check it out here. 3. 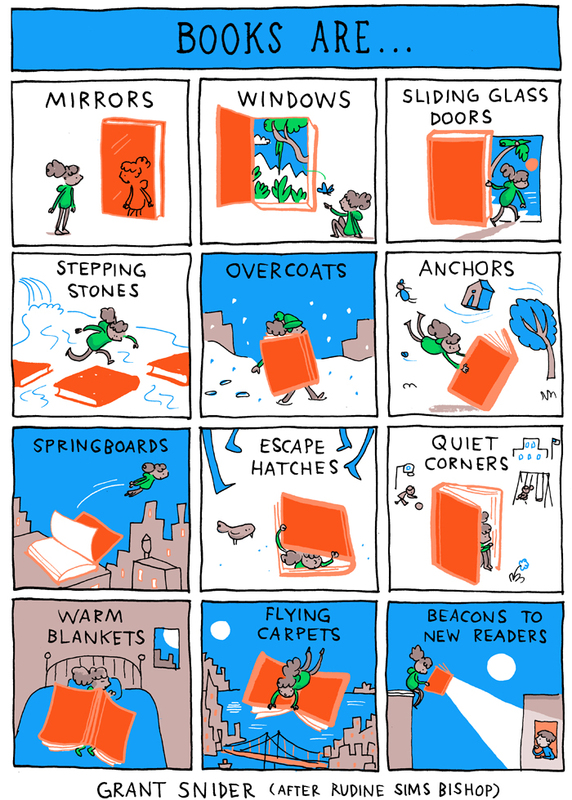 Reader Identity- Joel Garza & Scott Bayer got me thinking about my own reading habits, my comfort zone, and my identity. I hadn’t ever thought of my reader identity until this session. And I got straight to work on this task! I’m going to become more dedicated to reflecting upon the books I chose, hopefully to find patterns, and to break out of my comfort zone. Everything I bring into my own reading is going to reflect back into the reading I ask my students to do. This session really hit home, especially because I’ve spent the past few months reading G.R.R. Martin’s Song of Ice and Fire series for the third time. I’m starting to think that this is kind of a selfish move! Yes, I want to write academic papers on a fantasy novel series I adore. But how is that helping my students? How is that affecting my teaching? And if I’m not actually writing a paper, then do I need to hang out in Westeros all the time? And reading something so comfortable & familiar isn’t going to help me grow as a person, a reader, or a teacher. 4. The last session I want to talk about was presented by Daniel Summers. His ideas on brainstorming & getting to students to ASK questions are things I want to incorporate into my own teaching practices. According to Summers, students are full of questions. But they are scared to ask them. And if we want them to write, we have to get them to ask great questions they can actually expand upon. I really struggle with implementing the brainstorm stage of the writing process. Brainstorming gets messy and noisy and isn’t easy for students. I love the idea of focusing on questioning in order to get students to a workable thesis. My favorite take away: “To know ____, you have to picture ____”. So, to know WVELA19, you have to picture a room full of curious teachers, who love books & kids & writing & words & poetry & pronouns & Shakespeare & growth. I can’t wait to see where the National Writing Project of WV & the WV Council for Teachers of English will take us next year. But you best believe I’ll be there with my ideas and questions.